Who doesn't love snacks? But they need to be low calorie for me to not feel completely guilty about munching on a yummy snack. MyBlogSpark contacted me about sampling some of the new Pillsbury Baguette Chips. If that’s not enough to get your mouth watering, then check out these delicious chips for yourself. To download a printable coupon for $0.75 off one package, you and your readers can visit http://bit.ly/PBCcoupon today! *Pillsbury Baguette Chips (5g fat per 29g serving); regular potato chips (11g fat per 29g serving). See nutrition information for sodium content. I have to tell you, my favorite of the two flavors is the Italian Cheese & Herb. It is so tasty! The kids enjoyed both flavors equally well. We'll be taking some with us to the assembly this weekend. I would love to see these come out with Parmesan Bacon. YUM! But you know I love bacon anything. I think these would be great in a snack mix. You know like the Chex mix, pretzels, nuts, m&m, cheddar nibs. 1. 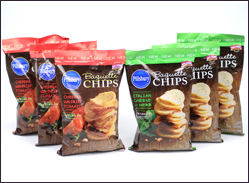 Leave a message telling me which flavor you would like best, Cheddar Sun-dried Tomato or Italian Herb & Cheese. 2. Leave a message telling me which flavor would you like to see the chips come out with next. 3. Leave a message telling me how you plan to use these to spice up your snacking routine. This giveaway will end next Wednesday at 9:00 p.m. EST. Have a great week! 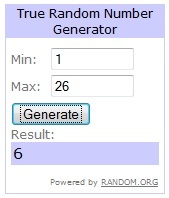 And the winner is #6 - Donna Rubright! Disclosure: The product, gift pack, information, and additional sample have been provided by General Mills through MyBlogSpark. Im excited for sun dried tomato! I want to see a cinnamon sugar flavor next! I would have these chips with salsa and guacamole! I would like to try the sun dried tomato. I love sun dried tomato! How about caramel for a new flavor. Bacon is a good idea as well. I would love to try them with chicken salad or tuna salad on top. A great snack would me the Italian herbs with some bruschetta! I would dip these in hummus! I'd like to see them come out with a French Onion flavor.